It’s very puzzling that after all this time tango-ing with insanity, Sarah Palin’s garbled thoughts and feelings still matter to literally anyone. But here we are! 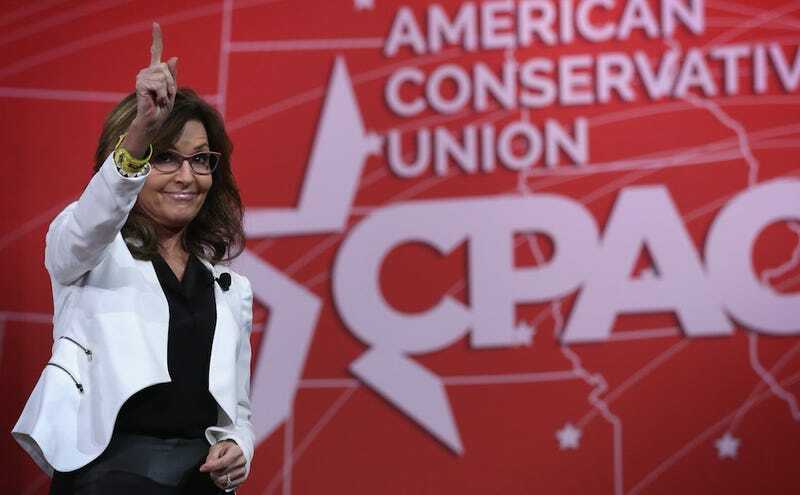 According to the Washington Post, a charter flight from Anchorage was seen landing in Des Moines around 8 PM last night, leading supporters to believe that La Palin would be the guest at this rally, because who else lives in Alaska? Plus, Palin and Trump are buds; he has floated the idea of having Palin as a member of his doomsday cabinet (she has her eye on Energy Secretary, because she loves “oil and gas and minerals”). “I think it would be a blow to Sarah Palin, because Sarah Palin has been a champion of the conservative cause and if she was going to endorse Donald Trump, sadly she would be endorsing someone who’s held progressive views all their life on the sanctity of life, on marriage, on partial-birth abortion, he supported [the] TARP bailout — it goes on and on and on,” Tyler said. “Donald Trump claims he’s changed all those views. But I think if it was Sarah Palin, let me just say I would be deeply disappointed,” Tyler added. Boys, boys! C’mon. Sarah loves you both. The announcement will be streamed here at 5 PM CST.